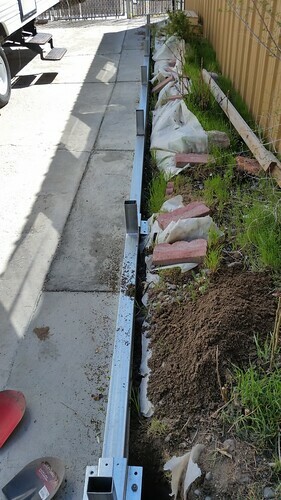 With the concrete pad widened, we commenced to assembling the base rails. The two base rails (which are assembled from several shorter sections)are what attaches to the ground. 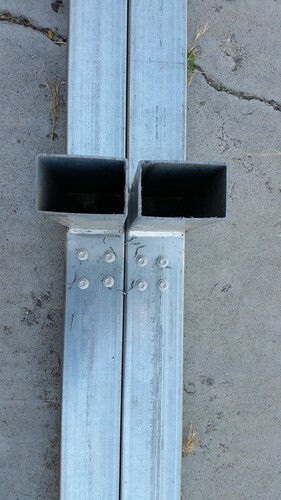 The vertical risers (seven sets of them) then attach to the base rail. Here are the the two base rails side by side shortly after Lisa did the very first joint. We pushed sections of base rail together, and Lisa drilled the heavy self-tapping sheet metal screws into the assembly. As you can see, these sections use four screws per join. Then it was time to temporarily pull the travel trailer out of the way so we could use the concrete pad as an assembly area. 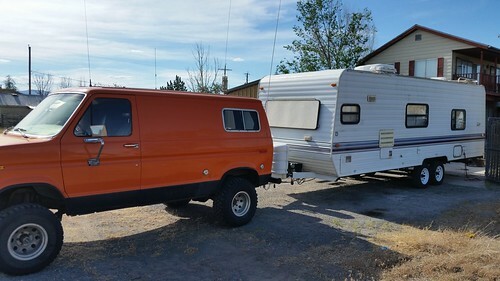 The trailer hadn't moved for several years, and the two tires on this side were initially too low to move it even the few meters out necessary here, but Lisa jacked up the trailer and we took the tires town to Hanneman Service and refilled them long enough to make the move. 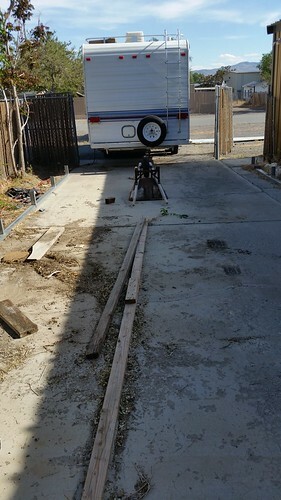 Although she had to disconnect the sewer line, the electrical connection would reach, so she could continue to use the trailer. However, because the trailer must be completely level in order to use the refrigerator and it's very difficult to level it in this configuration, she had to empty the 'fridge and turn it off while it was pulled out like this. We started clearing the concrete pad to begin the next phase of construction. With the base rails roughly in place, we started building the roof members, which we needed before we could secure the rails into their final position.